Acts 21:1 When it happened that we had parted from them and had set sail, we came with a straight course to Cos, and the next day to Rhodes, and from there to Patara. 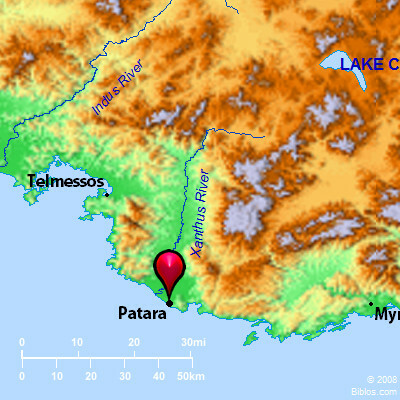 pat'-a-ra (ta Patara): A coast city of ancient Lycia, from which, according to Acts 21:1, Paul took a ship for Phoenicia. Because of its excellent harbor, many of the coast trading ships stopped at Patara, which therefore became an important and wealthy port of entry to the towns of the interior. As early as 440 B.C. autonomous coins were struck there; during the 4th and the 3rd centuries the coinage was interrupted, but was again resumed in 168 B.C. when Patara joined the Lycian league. Ptolemy Philadelphus enlarged the city, and changed its name to Arsinoe in honor of his wife. The city was celebrated not only as a trading center, but especially for its celebrated oracle of Apollo which is said to have spoken only during the six winter months of the year. Among the ruins there is still to be seen a deep pit with circular steps leading to a seat at the bottom; it is supposed that the pit is the place of the oracle. In the history of early Christianity, Patara took but little part, but it was the home of a bishop, and the birthplace of Nicholas, the patron saint of the sailors of the East. Though born at Patara, Nicholas was a bishop and saint of Myra, a neighboring Lycian city, and there he is said to have been buried. Gelemish is the modern name of the ruin. The walls of the ancient city may still be traced, and the foundations of the temple and castle and other public buildings are visible. The most imposing of the ruins is a triumphal arch bearing the inscription: "Patara the Metropolis of the Lycian Nation." Outside the city walls many sarcophagi may be seen, but the harbor, long ago choked by sand, has been converted into a useless swamp. another at grace, in addition to which two other cups have been added, the 4 according to the Mishna (Pecachim x.1) symbolizing the 4 words employed in Exodus 6:6, 7 for the delivery of Israel from Egypt. Instead of eating in haste, as in the Egyptian Passover, it is customary to recline or lean at this meal in token of Israel's freedom. PAT'ARA, a seaport town on the s.w, shore of Lycia, opposite Rhodes. Now in ruins hut retains its ancient name. Patarus was the son of Apollo, hence the name Patara where this god was worshiped.